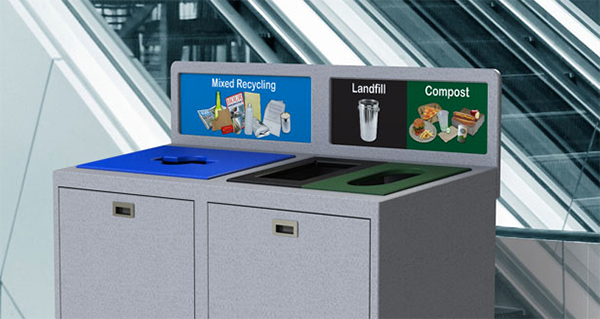 When your recycling needs are as unique as the business you’re in, CleanRiver will work with you to design and manufacture a custom solution. We’ll listen to your challenges and learn about your program’s goals to come up with the perfect customized design that fits your specific needs. We’ll use a variety of different materials, unique openings and custom graphics to deliver a solution that’s exclusively yours. A roll away success with custodians! Coastal Carolina University needed to keep high traffic areas as clear as possible for fans. 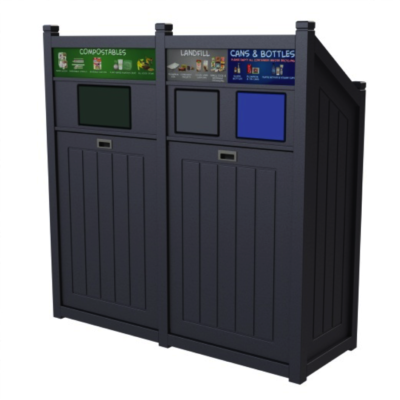 So CleanRiver custom-designed a container that houses two 48 gallon roll-out carts to collect all the post-game waste without taking up too much room. 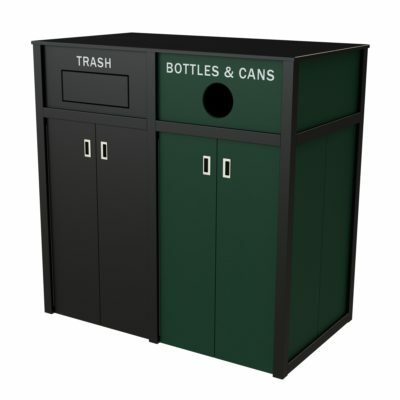 The unit’s front service doors and custom-designed lowered floor were designed to help make the custodial team’s job easier when emptying the high volume of waste and recycling collected in the containers. 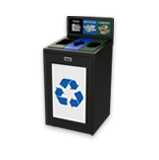 CleanRiver has helped some of the largest manufacturing facilities of cell phones and automobiles save thousands of dollars in waste disposal and safety equipment by designing customized recycling bins to support their unique recycling program needs. 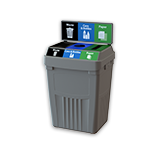 CleanRiver’s 2-stream Flex E™ Bin with customized top plates was the perfect solution. 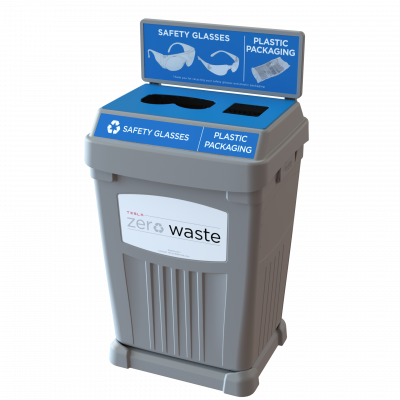 Placed right next to the safety glass dispensary, the Flex E™ Bin aids Tesla in collecting not only the used glasses but the plastic film removed upon first use. 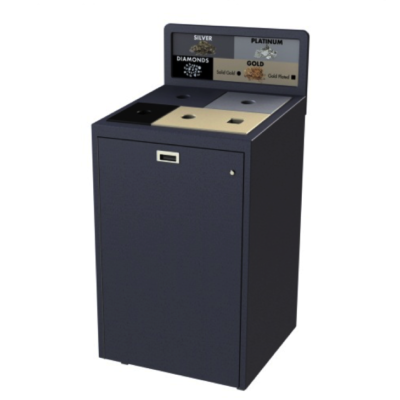 Save precious assets from theft. Richemont, a jewellery manufacturer, wanted a secure container to collect valuable precious metal and gemstone scrap material. 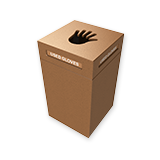 So CleanRiver designed a strong, lockable container with small openings perfect for the deposit of the precious metal and gemstone scrap, but too small for hands to reach into the container. 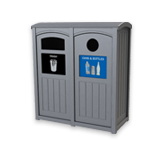 Babson College wanted a unique bin to increase their diversion rate and clean up stream contamination. So CleanRiver designed a versatile container that showed campus specific waste using a diorama that could be easily switched up for another one as their campus packaging, or needs, changed. Keep pests out of your bins. Google needed to solve a pest issue to keep the recycling and waste in their bins, while keeping the squirrels out. 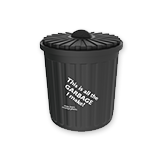 So CleanRiver designed a bin with self-closing flaps that has proven extremely successful. Collect key inventory for re-use. 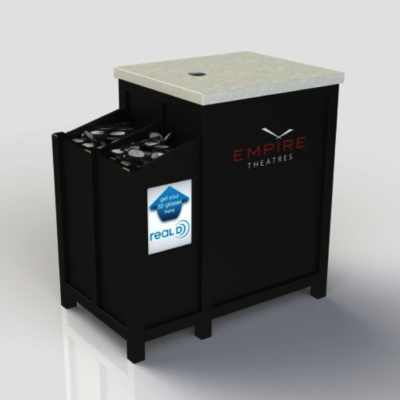 Empire Theatre wanted to recycle ticket stubs while providing storage that housed 3D glasses for customers to collect when they hand over their tickets. 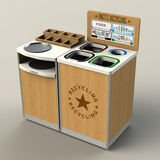 So CleanRiver designed a custom Corian top to the recycling container to fit with the aesthetic. 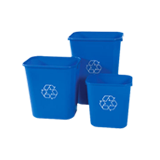 Save money by reducing landfill waste. Blackberry was throwing away gloves by the handful. 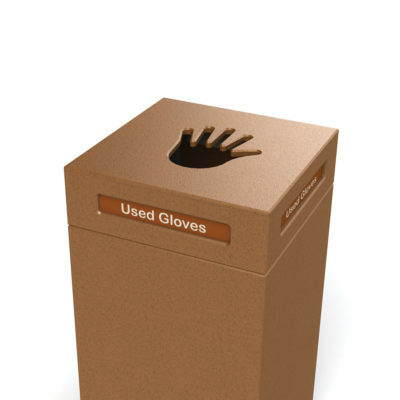 So CleanRiver designed a bin just for gloves, so they are collected, washed and reused, resulting in less cost to replace gloves as well as reduced landfill fees. Pret a Manger needed to collect four streams in a small space. So CleanRiver designed a completely unique unit to address their footprint and capacity needs while fitting in with their décor. 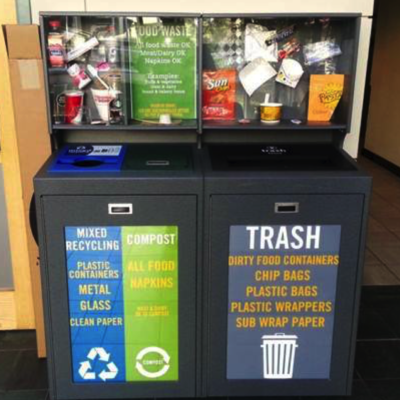 A unique bin maps out recycling success. Little Rock Zoo was wasting money on reprinting maps. 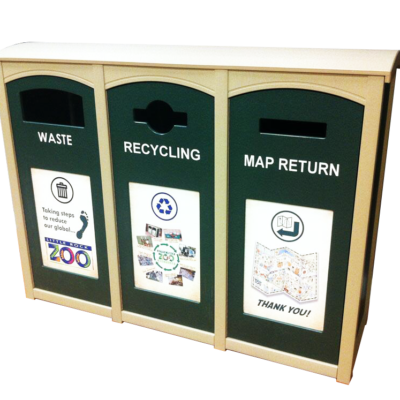 So CleanRiver added a unique graphic to their existing bins so maps can be reused by future visitors.